It’s Autumn. Time for the root vegetables, squashes and pumpkins. The reason I call this version, “Fall Back Autumn Chop” is because we made it on Saturday, the 2nd of November, the day everyone turns the clocks back one hour. This time, I had some help. Nan of course gave me a hand and my friend Jackie drove over to help out. She wanted to see the process and learn how to make it. 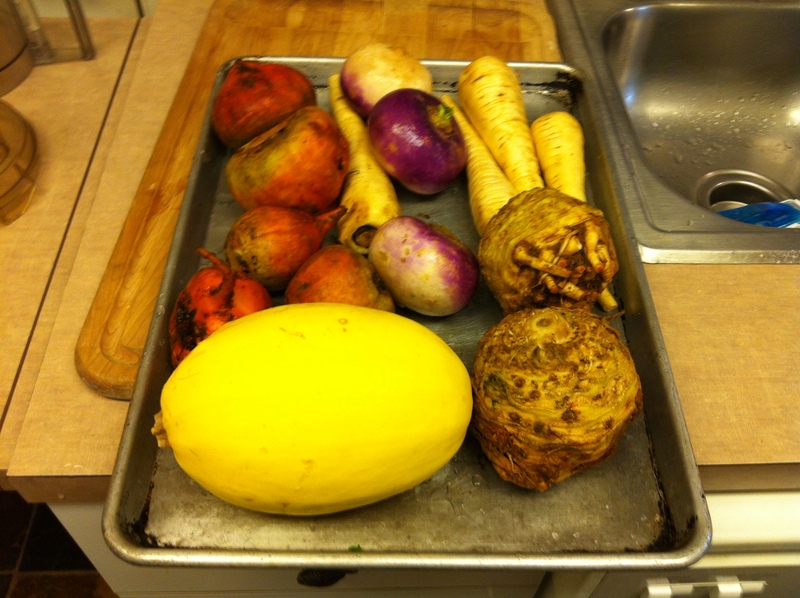 They are spaghetti squash, parsnips, turnips, celery root and golden beets. I also had a pumpkin. I have so much fun making Chop. It’s fun to be creative, find great new items to add to it and enrich your flock’s diet with nutritionally dense ingredients. I’ve taken people to the grocery store to show them how to shop for Chop. You have to think about flavors, textures, colors, and of course, nutrition. Despite this challenge, it’s a fun and enjoyable process. I suggest you search local ethnic markets. I stumbled upon a Russian-Eastern European market and was able to locate all kinds of wonderful things, including buckwheat! I simply couldn’t find it. And not only did I find that, I found unsweetened dried coconut, and other assorted neat stuff to put in my Grey’s’ Chop. So search out some of the ethnic markets. You never know what you might find. So without further ado, here is the latest Chop Video for your Chopping pleasure. Oh yum.. how delicious that all looks. When you are next in a middle eastern market / food shop Patricia look for a grain called Freekeh.. GeeGee, my African Grey, is mad about it! It is very tasty indeed. I made chop for the first time today! It was fun and really exciting! Smidgen, my tiel, did an excellent job of supervising and taste testing. So here’s what I used: kale, daikon radish, frozen mixed veggies, frozen broccoli, red pepper, sweet potato, red quinoa, and steel-cut oats. It didn’t come out the prettiest either, but a still good start. I made waay too much, so I hope they like it. Patricia, I have been following you since last January. I have made chop twice since then – both times with extremely awesome success. (I made such big batches that I have never run out.) My little budgies, Belle and Lucky love it and dive in soon as I put it in their bowl. My last baggie is now defrosted and, procrastinator that I am, I am in a flap getting my next batch done. As I always do, I turn to your blog to get inspired and you never fail to do that. Unfortunately, there will always be some toxic, negative people who, in spite of NOT doing research,will try to discredit people such as yourself. You are a target because you have a cause and a following and you are successful. Please take satisfaction in the knowledge that through you, thousands of birds are being fed a nutritious, balanced diet of vegetable, grains, pellets. Hi Cami, I suggest that you mix the seed and chop together, just a little at a time with more seed than chop to begin with. He’ll just pick out the seed and will eventually get some of the veggies by accident. Gradually add more chop. I did this with my budgies and they love chop now. Seed is just a sometimes treat for them now. Good luck with it! Thank you so much I will try and hope it works !